I can recall stumbling out of the hotel and walking westward through the center of Kunming along Dongfeng Lu, stopping frequently to absorb the sights, sounds, and smells of that great melting pot of a city. My first nourishment was a big bowl of mixian topped with bits of deep fried garlic and tiny cubes of dried horse meat. Eventually I found Cuihu park , where I listened to folk songs in various non-Chinese languages, and then wandered vaguely back to the east side of Kunming along Yuantong Jie. On the way, I discovered the very first Chinese Buddhist temple that I ever visited, Yuantong Si . The gate ticket that I saved (see scan above), became the cornerstone of a gate ticket collection that has since swelled to fill a fat envelope . So this will be the first blog post in a series about the various temples, museums, and sites of interest that I have visited in China, Japan, Taiwan, and India. At the time of my first visit, Yuantong Si was somewhat forlorn. I was able to spend a long time at the concession stand looking at every single print and trinket that they had without anyone else around. Little did I know that the temple was established more than 1,000 years earlier, and was at times an important center for Ch’an practice and at other times a rooming house for French Imperialists. The central pavilion, which sits in between two ponds and is accessed by beautiful stone bridges in front and back, was locked up, and the incense braziers in front of the main hall were only burning a few handfuls of red-stemmed joss. 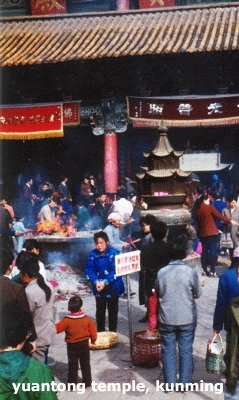 When I next visited Yuantong Si (in 1993), I happened to arrive on a festival day. During the intervening three years, a Buddhist revival had been slowly gaining ground, and it was quite interesting to see the courtyard full of visitors conducting all sorts of rites that had almost nothing to do with one another. Here someone was bringing a basket of fruit for the shrine, there someone was lighting a whole bundle of joss sticks at once, creating a giant flame. In the middle of this were people doing prostrations to the four directions, while mobs of day-trippers and children wandered aimlessly, or stood gawking at the practitioners. 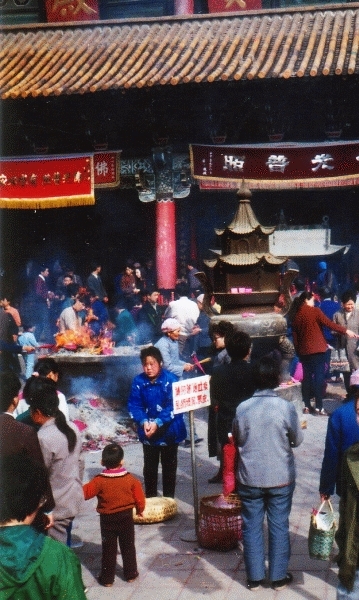 By 1997, when I next visited the temple, renovations had been made to the complex, including the installation of a multi-armed Kuanyin figure, and lines of people made their way to the braziers to burn incense and bow three times to the Buddha hall. My visits to Yuantong Si, then, were a sort of microcosm of the Buddhist revival that has taken place in China over the last twenty years. What a nice place to start my career of temple hopping, and how lucky I was!